Infused with what is reportedly the beauty world’s most powerful antioxidant, Idebenone, the exclusive anti-aging complex within this foundation continuously repairs skin’s appearance day after day whilst providing kick arse coverage that feels lighter than air. In a word: amazing. And yep, you need it. Pretty much from the moment you apply it, skin looks perfected – and not just in a “we camouflaged the rough stuff” sense of the word. The lightweight formula – which has an all day wear time – provides what I would call medium coverage, and a little goes a very long way. It has an instant firming and nourishing effect thanks to the aforementioned powerhouse antioxidant, Idebenone and Hydra-Pigments are included in the formula too to instantly blur skin’s imperfections while helping to seal in moisture for a radiant look. Vitamin C and key anti-aging ingredients come along for the ride to help boost the skin and give a firmer, clearer look, and it’s an effect that seriously lasts all day. I am so impressed with the level of pigment in this foundation and find that just a few drops dotted on and blended well do wonders even for an after hours look. It is also easily buildable as it can be layered upon without becoming patchy or streaky, and it’s remarkably lightweight considering that it come so generously pigmented. When I first heard about it I incorrectly assumed that this foundation would be more akin to a BB Cream as it combines the benefits of skincare with makeup, but it definitely performs like a true foundation - just jam packed with skin-loving ingredients. So, in a nutshell: for the first time, the Elizabeth Arden brand is infusing award winning PREVAGE technology into colour cosmetics and yes, it is an absolute winner. Even the packaging in minimalist yet luxe, and although I am only about a third into the bottle I am guessing that this beauty will last me a long time. 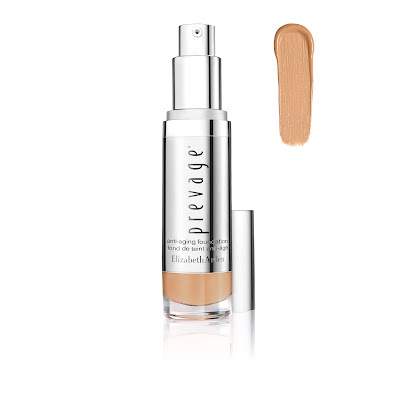 Available on counter right now, Elizabeth Arden PREVAGE Anti-ageing Foundation SPF30 has an RRP of $106 comes in eight shades. Highly recommended.